Sister Laura Teresa Downing, I.H.M. Last week, as I drove home to see my family for a Thanksgiving visit, I was playing Christmas music on the car radio and singing along at the top of my lungs. After several miles and many contemporary renditions of classic Christmas tunes, it happened … my favorite Christmas song, Andy Williams’ “It’s the Most Wonderful Time of the Year,” came on the radio. Driving through Chadds Ford on Route 1, I realized anew how true Andy’s sentiments are. This really is the most wonderful time of the year! Advent, the joy-filled season that leads up to the grand celebration of Christmas, begins December 2, and with it a new liturgical year. Despite my love for Advent, I have never felt like I did Advent well. Allow me to explain. I feel like I know how “to do” Lent, but I have yet to wake up on Christmas morning feeling satisfied that I have lived Advent deeply and well. It seems that no matter what I do, the silence and prayerful waiting that I yearn for are overshadowed by the noise and busy-ness of social engagements and shopping. Perhaps you can relate? For this reason, I have decided to try something new this year, and I invite you to consider doing the same. As I mentioned earlier, the first Sunday of Advent is the New Year’s Day of the liturgical calendar. So I am making a resolution to enter fully (not perfectly!) into this Advent. Several years ago, a wonderful sister with whom I was missioned introduced me to the acronym “JOY.” In the acronym, J stands for “Jesus,” O for “others,” and Y for “yourself.” Considering that the season of Advent is as much, if not more, about joyful anticipation as it is about silent and prayerful waiting, it seems an appropriate way to organize my resolution. Allow me to share some of my musings in the hope that they may help you to form your own Advent resolution. Jesus: In order to live this Advent deeply and well, I will strive to be more intentional and present in my prayer life. Though this does not necessarily mean that I will have more prayer time every day, it does mean that I will pray especially for the grace to fully open my heart anew to our incarnate God. Others: In order to live this Advent deeply and well, I will endeavor to make my gift-giving meaningful. Avoiding the trap of buying the best, brightest, and most popular gifts simply because I can, I will choose instead to give gifts that better reflect and express the relationship that I share with the persons to whom I give them. Additionally, I will share my time, talent, and treasure with those who previously would not have been on my gift-giving lists. Finally, I will be more mindful of praying for the needs and intentions of my family, my friends, and especially those who find this time of year difficult. Yourself: In order to live this Advent deeply and well, I will make it my goal to slow down, so that I may better recognize God’s presence around and within me. As we begin this new liturgical year, let us be intentional, but above all, let us be joyful as we prepare to celebrate the coming of our Lord. I wish you a blessed Advent, a merry Christmas, and happy and healthy new year. 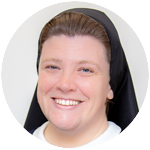 Sister Laura Teresa Downing, I.H.M., is an instructor in the Theology and Philosophy Department at Immaculata University. Way to go Sister! Thank you very much for your excellent reflection. May the peace of Christ be with you. Happy Advent!